The reservations desk for Silhouette's specialty restaurants. Above: The elegant Murano specialty restaurant.. 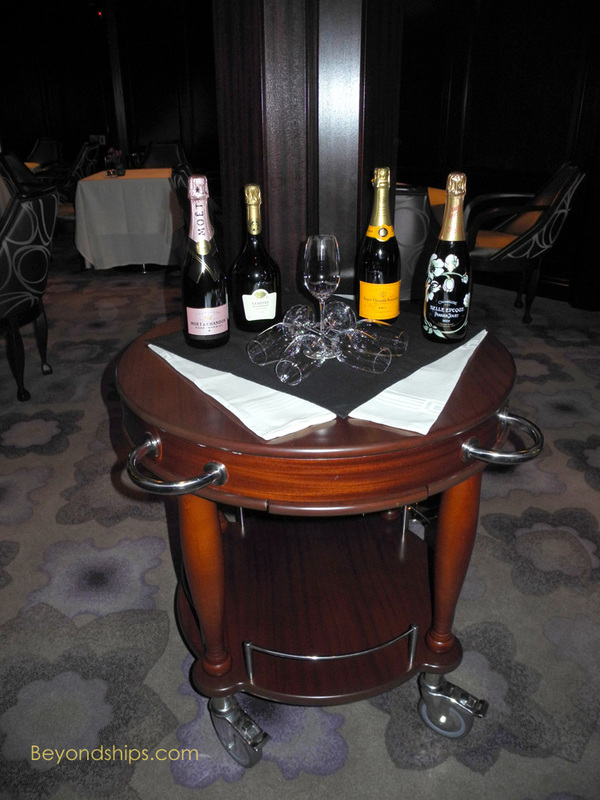 Above: A perfect start - - Murano offers real champagne by the glass. Below: A grand finale - - a Murano's souflle. 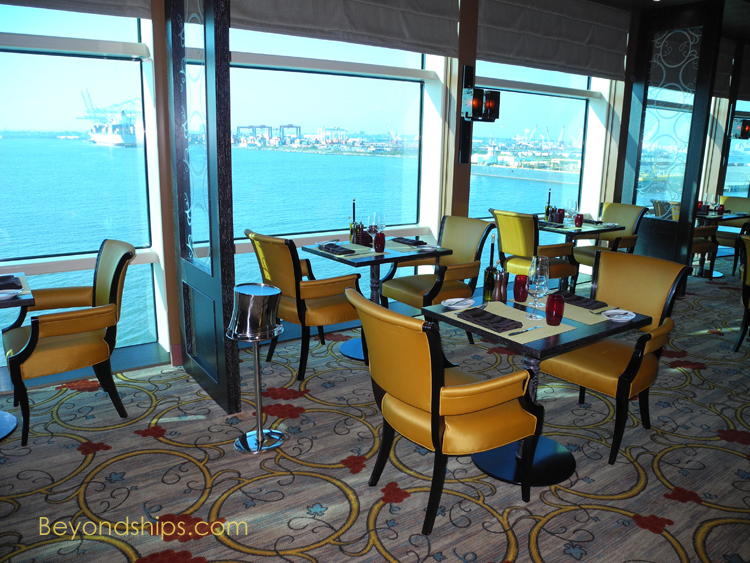 Above: The Tuscan Grille has floor-to-ceiling windows that give spectacular views over the ship's wake. Below: The entrance to the Tuscan Grille. Above: A table at Qsine. 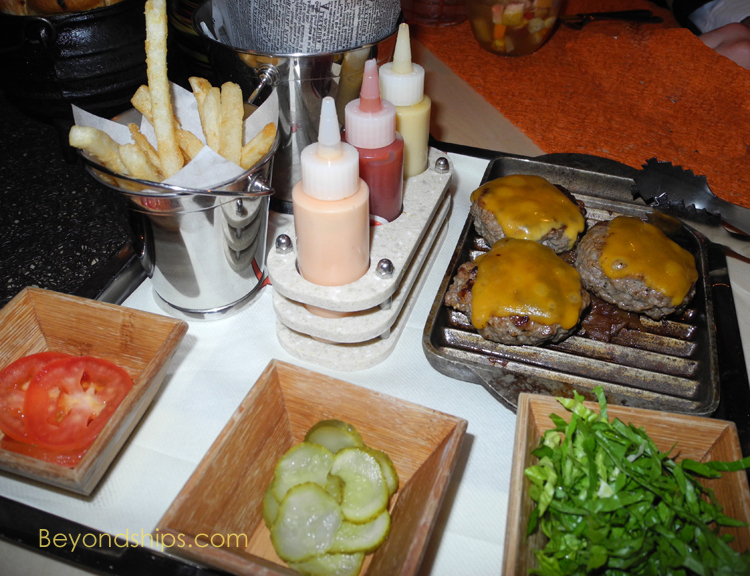 Below: M's Favorites, a dish at Qsine, arrive at the table in a suitcase. Above: The Lawn Club Grill (at left) looks out upon a half acre of real grass. 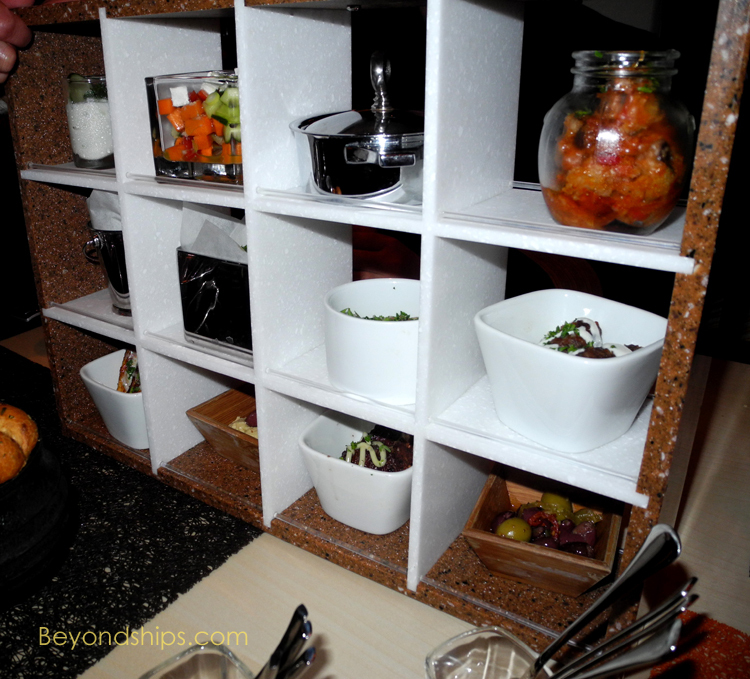 Below: The the kitchen in the Lawn Club Grill is open so that guests can participate in making their meals. Above: Mr. Echaiz displays a pizza that he prepared at the Lawn Club Grill. Below: A main course at the Lawn Club Grill. 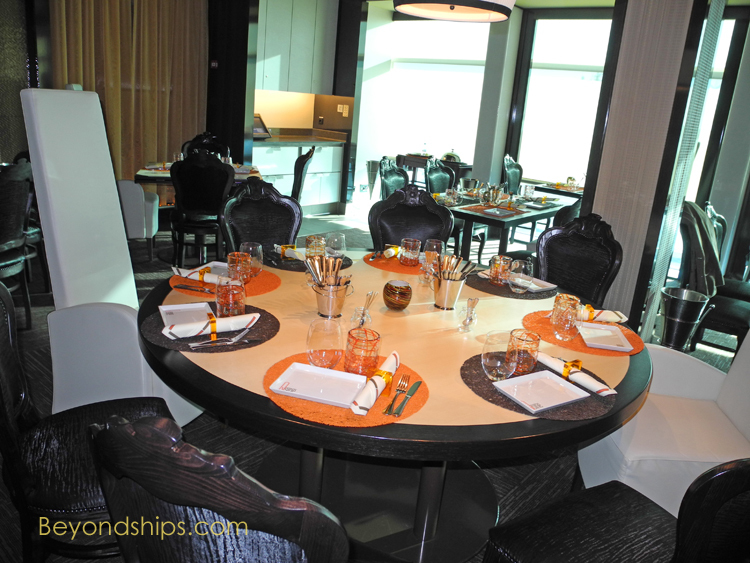 Celebrity's signature specialty restaurant is Murano, "our fine dining restaurant." This is a gourmet venue with an elegant and sophisticated style. 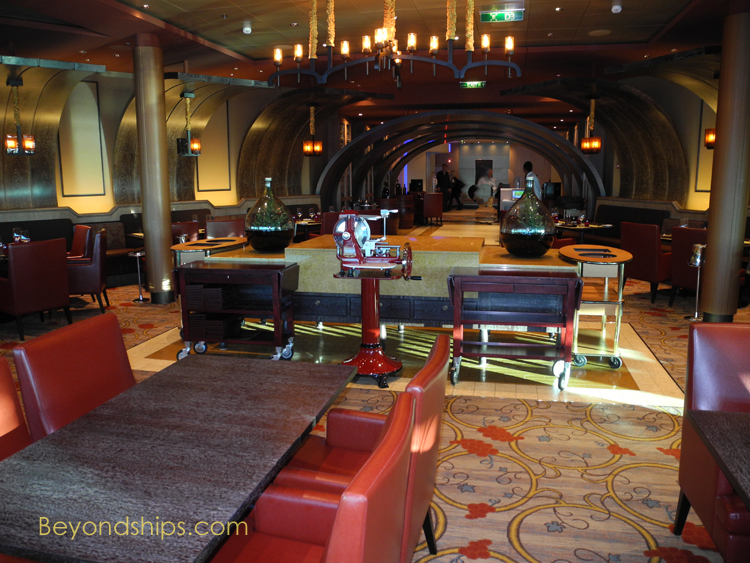 The concept is the same as the original specialty restaurants on Celebrity's Millennium class ships, e.g., The Ocean Liners on Celebrity Constellation and the Normandie on Celebrity Summit. "On the Solstice class, we do not change the name as on the Millennium class. It is Murano throughout all the Solstice class ships." Murano features a "very elaborate menu with all 100 percent ala minute cooked and fresh product. You have the Fine Senses dinner on the left side that is basically a fixed menu, a little bit of a taste of the regular menu and it is paired with specific wines. 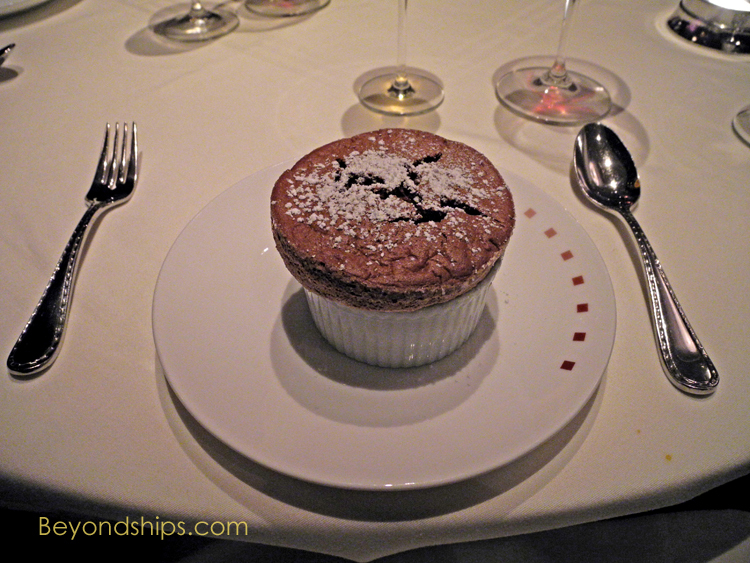 You will experience all five senses with food, service, and wine, for a fixed price. Then on the right side you have the regular menu and you can pick out whatever dishes you want - - two, three, four - - whatever is your taste." "The service is outstanding. You have one waiter for every couple of tables and so he will be 100 percent involved in your experience. A lot of dishes are prepared right there table side in front of you, which makes it very special." The restaurant also has a dedicated sommelier. Because of the expense of operating such a venue, restaurants of this caliber are becoming increasingly scarce on land, not to mention at sea. "But we want to give that experience to the guests, continuing the tradition of our fine dining restaurants. We couldn't be Celebrity without Murano.". Like Murano, the Tuscan Grille offers a multi-course dinner for a fixed charge. Overlooking the ship's wake from the back of Deck Five, it offers "the best view in town." The Tusacn Grille is styled as an "Italian steakhouse with a seafood influence. You are going to feel half in Italy." "The variety is immense. The menu goes from deep fried calamari to beef raviolis to beautiful salads like arugula and mozzarella. You have the cioppino, a seafood soup that is beautiful You have the onion soup Tuscan style that you cannot miss. You have steak tartars and all this is as a first or second course." "Then you divide in three the main courses. You have pastas - - linguini with lobster, you have your mushroom raviolis, all kinds of pasta. Then you go to your fish - - tuna is my favorite, amazing presentation - -scampi and scallops, And the final part of the steakhouse, you have your rib eyes, filet mignons, veal chops." "You have a separate dessert menu. You have: tiramisu, a classic Italian dessert; A fondue, in which you can dip your marshmallows and pineapples in chocolate." "Also at the entrance, you'll see we have all these bottles of wine displayed there. We have a beautiful selection of wines." Neighboring the Tuscan Grille on the starboard side is Qsine " - - uniquely unordinary, quite an experience. The first one was on Eclipse." "Qsine is the creation of our master chef Jacques Van Statden. I would say it is a journey through Jacques' mind - - his culinary experience around the world put together into one restaurant. You cannot define it as Italian, French, Mediterranean, South American - - no, it is Qsine, just Qsine." It is clear that Qsine is different from the moment that you walk in. "You go inside, you have lamps that are upside down, chairs that are not even, kind of an Alice-in-Wonderland decoration and design." "You sit down and you [are given] an iPad - - that is already something different and unordinary - - with videos of every dish." You do not order an appetizer, soup, and main course. Rather, the menu items are "all dishes and they will all come as they are ready in the galley. So you pick out ten dishes and the [kitchen] will start preparing all ten and as soon as they are ready, they start coming out." This unique approach carries through into "the presentation of the dishes. You have them in such different ways like: M's Favorites comes to your table in a suitcase. [Another dish] comes with blinking lights. The Slider Party comes in cast iron pots. The whole point is to have fun." All of this can be overwhelming to the uninitiated. Therefore, the waiters do not merely take orders and bring food to the table. "The waiters are called culinary tour guides. They will guide you through the culinary journey of Qsine. First of all they will explain the concept. Then they will guide you through the menu - - how to order and how much to order. They have experienced the whole menu themselves, so usually they are giving ideas. They do not just carry food, they guide you throughout." "The Lawn Club Grill is also a creation of our master chef Jacques Van Staden. Something that was missing [from Celebrity's line-up of specialty restaurants] in his view was something interactive, something where the guests can actually participate with us and be part of the whole experience." At the Lawn Club, "you start with the flat breads - - pizzas - - and you make your own. Then we have a nice meat refrigerator where you can choose your meat cuts, your fish, a beautiful selection of seafood and you can grill them yourself. They give you aprons and hats and you feel like a chef." Besides being fun, it is also a learning experience. The preparation and cooking is done under the supervision of one of the restaurant's chefs "They are very knowledgeable and so you can bring home a little bit of Celebrity cooking style and skills." If cooking does not interest you or if you are trying to escape such tasks while on vacation, "you do not have to cook. We will cook everything for you like a regular restaurant. Then you just sit and relax and we'll take care of everything." And there is much to be said for just absorbing the atmosphere. 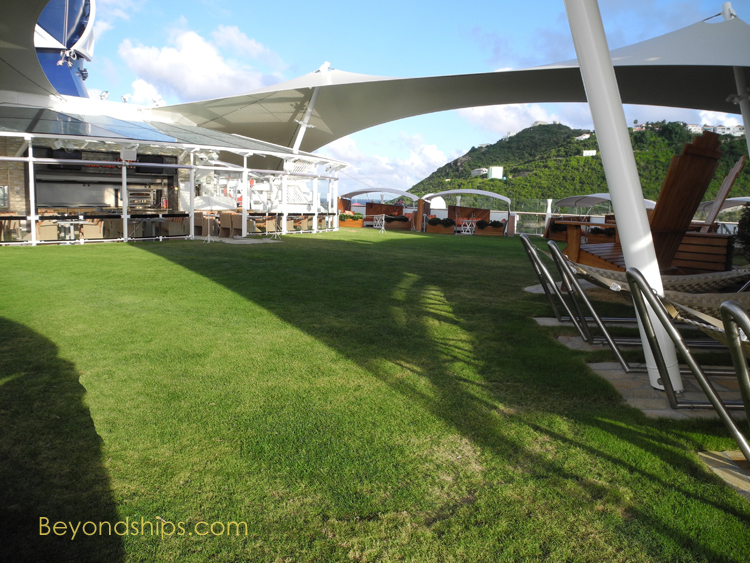 The restaurant opens out onto a large grassy area which is prettily it in the evenings, thus making for a nice view. Furthermore, on some nights, "we do live concerts right next to the Lawn Club Grill. You have the jazz band, you have our guitarist and you have the strings. So you can be there grilling your steak, enjoying a glass of wine, with the jazz band playing on the side, watching the sun set. It cannot really get better than that." While dining in the specialty restaurants has in the past been an evening affair, Silhouette opens Murano and the Tuscan Grille for lunch on sea days. The Lawn Club Grille is also open for lunch occasionally. In addition, it is used to give combination cooking classes and lunches, which must be pre-booked.